Citation Information: J Clin Invest. 2013;123(1):164-178. https://doi.org/10.1172/JCI65124. 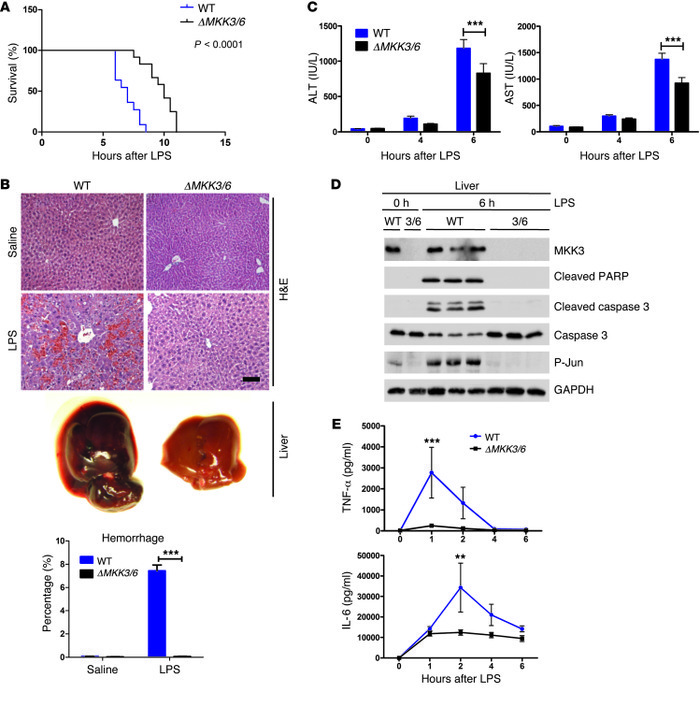 ΔMKK3/6 mice are protected against LPS-induced liver damage. WT and Mkk3–/–Mkk6–/+ mice (ΔMKK3/6) were treated with D-gal+LPS or saline. (A) Survival curves after D-gal+LPS injection (n = 21). Survival curves were created with the Kaplan-Meier method and compared by log-rank (Mantel-Cox) test. (B) Livers were removed at 6 hours after injection. Panels show representative H&E-stained liver sections and livers. The chart presents hemorrhagic area as a percentage of the total area (n = 6–8). Scale bar: 50 μm. (C) Serum transaminase activity at 4 and 6 hours after injection (n = 10). (D) Liver extracts were examined by immunoblot with antibodies to cleaved PARP, cleaved caspase 3, caspase 3, phospho-Jun and GAPDH (n = 6–8). (E) ELISA analysis of serum TNF-α and IL-6 at different times after injection (n = 16). Data are means ± SD. **P < 0.01; ***P < 0.001 (2-way ANOVA coupled to Bonferroni’s post tests).